Will Gran Selezione Pull Chianti Classico Out of the Doldrums? On my research visit to Tuscany last month for the Guide to Wines of Tuscany, I spent a morning at Rocca Delle Macìe, where I had a long conversation with Sergio Zingarelli, presently the chairman of the Consorzio of Chianti Classico. 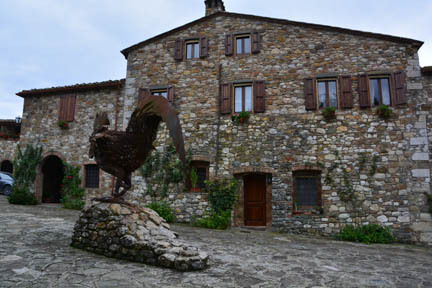 Founded by Sergio’s father in 1973 as a small winery, Rocca Delle Macìe has grown to include four estates in Chianti Classico and two in Maremma, and its total annual production is numbered in millions of bottles. The original winery is a tiny building now used to store botti, and around it is a gracious courtyard with family buildings and a tasting room; just below is the large, modern winery. I’m going to report the conversation verbatim without much commentary, as it casts an interesting light on the great progress being made in Chianti. “The second problem is that the best wines from the best wineries were not Chianti but IGT [the so-called super-Tuscans]. People would ask why the top wines were not Chianti Classico if they come from the Chianti Classico area and fit within the rules for the Chianti Classico blend.” The answer to this has been to introduce a new category, Gran Selezione, starting with the 2011 vintage. “It took two years to decide the name of the new category. The idea is that it has to represent the very best. In 2014 the first presentation was by 24 wineries with Gran Selezione; now there are over 100 wineries. Even some of the wineries that voted against have started the production of Gran Selezione. It’s important that the commission tastes the wine.” A big difference from Riserva (which still exists) is that wines must be approved: when I asked how often a wine is rejected, Sergio would not be drawn into details, but said that it’s certainly not a pro forma procedure. Will IGTs be relabeled as Gran Selezione, I asked? “This is our goal. We are waiting.” In the meantime, some new top cuvées have become Gran Selezione, including Rocca Delle Macìe’s wine named for its owner. “The Sergio Zingarelli cuvée would have been an IGT if the Gran Selezione category had not been created,” Sergio says. I have come across a couple of former super-Tuscans that are now labeled as Gran Selezione, but most producers tell me they do not plan to change the label. I admit I was sceptical when I first encountered Gran Selezione. However, whereas at the first showing, most Gran Seleziones were the same cuvées that had previously been labeled as Riservas, in Tuscany last month I found many new cuvées, often representing single vineyards or specific terroirs, and the quality was a definite step up from where Riservas used to be. Is Chianti Classico closing in on Brunello di Montalcino (where the wines have to be 100% Sangiovese) in terms of quality? This entry was posted in Wine and tagged Chianti Classico, Gran Selezione, Rocca della Macie, Sergio Zingarelli by Benjamin Lewin. Bookmark the permalink.